It was about a year ago that Lauralee Bell was making the rounds to promote her Lifetime film, Mistress Hunter. This time around, Bell is promoting the Lifetime Movie Network film, Nightmare Tenant. "They have me on a schedule," the seasoned star joked about her relationship with the networks and the movies' producer. That's right, she's not only working with the Lifetime family again but with the same person who produced Mistress Hunter, this time earning an executive producing credit, as well. Bell takes the entertainment business very seriously, wanting to make the "most realistic and natural movie possible." "I'm so happy to work with this group again that if I could do one or two a year, I would, and if I could still do Y&R at the same time, that would make me super happy," Bell said. Related: Lauralee Bell Loves Her Upcoming Movie Mistress Hunter - You Will Too! Bell isn't only helping her career by starring in these movies; she's also a fan. "There's a bit of formula to them, but I feel over the years they've brought them up a notch in terms of a little bit more suspense. And during an early scene, I actually had to look away once. I was kind of scared although I knew what was coming," she said referencing Nightmare Tenant. 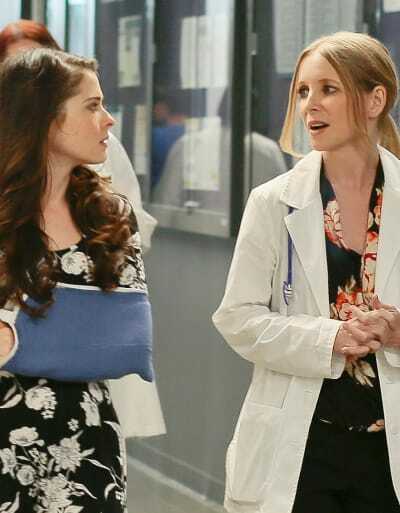 In the latest project, Bell stars as single mother and doctor, Carol Allen, who raised her beautiful daughter, Lacey, to be like a chip off the block of previous Allen women. She's vivacious, studious, and attending their alma mater, Vanderton University. Lacey discovers she's more concerned about her mother's socialization after she leaves than she is about leaving home for the first time, and she suggests perhaps inviting someone nearby to share the house with her after she's gone. Bell said, "I sort of listen to her and roll my eyes and send her off. And then the next day, coincidentally at work, there is a young woman who was asking for a female doctor, and she asked me to examine her. Her arm is badly injured. "And long story short, by the end of our conversation, I kind of make a comment, 'Should we go tell your parents nothing's broken, you're going to be fine?' And she proceeds to tell me that her parents are no longer around, and she's not sure where she's going next, and it's just as a doctor and a mother, my heart is broken for her. "And my daughter's idea clicks in my head, and I offer to let her move in for a brief time until she gets her feet back on the ground." Bell laughs, "And then slowly but surely, everything in my life starts to crumble. So this nightmare tenant does some things. You have to watch to find out. It all makes sense towards the end why her character's doing what she's doing. "But it's kind of what everyone fears; they do something out of the goodness of their heart and then really regret it." Bell said there is an "AHA" moment in the end with all the signature LMN flicks including "struggles and craziness," but there's a "nice little happy ending," too. Bell is also still keeping alive the possibility that her last film for Lifetime, Mistress Hunter, would make a great series. "It's another strong female lead and her job would be to work with the Mistress Hunter to help other women in a bad situation, not to waste their time, get out and get on with their lives and have a chance at the happiness that they deserve. "I think Lifetime is pushing for that sort of feeling. And so I'm happy to do that." Of course, Bell isn't only doing primetime movies. She's starring on a front-burner story on The Young and the Restless, the soap opera she joined in 1983. Her character, Christine, is the Genoa City District Attorney and avidly trying to put three important women behind bars! We're talking about the Newman family -- Nikki Newman, Victoria Newman, and Sharon Newman. All three are on trial for their part in "killing" Victoria's ex-husband and fiance, JT Hallstrom. "It's so funny because when I was filming the whole trial, I was so caught up in, 'Oh my God, I finished these long prosecution scenes today. Okay, here's the script for tomorrow.' I'm almost more exhausted watching it -- with happiness and relief -- than I was filming it. "Whenever they tell me I'll be doing another trial, I get excited, but I also get really scared, because I just know what comes with that." We've seen the verdict by now, and the first reference of Paul Davidson's return. Like many fans, Bell is interested in the return of her on-screen husband and what it could mean for her character. In three words, she mentioned babies, development, and life. It's something viewers have been hoping for years. "We're such good friends in real life, and we have so much fun. I'm nothing like my character. We're total goofballs," Bell said. "So for us to then get together -- Mr. And Mrs. Goof -- and have to do these scenes and he's a police chief where we're putting together these crimes and building the pace of the scene, and it's hard. "We want scenes in an apartment where we have silly and light conversations that are not completely focused on our jobs." Bell continued, "Doug is really missed at this trial. I needed to be the ball buster in the courtroom and would have liked to show a counterpoint with Christine and Paul at the GCAC bar talking about how hard it was in court, being human and complaining about doing what the DA has to do even if I don't necessarily 100% agree or don't have horrible remorse for what my character had to do. "And it also doesn't mean that I don't love the Newmans too. It was hard not to have those scenes [with Doug] because I get so stuck in this mode of seriousness now. I would love for Christine to go to a Danny Romalotti concert or do something to lighten up again. She needs something that would make her a whole person again. "So I'm hoping Doug's coming return can do that." Bell spent a lot of time as a child feigning sickness so she could stay home from school and soak in knowledge from her father, William J. Bell, the creator of Y&R, Bold and the Beautiful, and Another World. She's had a life of working in the soaps and said her advice never wavers. "First of all, I think we are in a good place and have good leadership right now. But my advice, always, is to bring everybody back that the fans want. Bring them back, even if it's for two shows, or two weeks or two months. Why not?" It's not an exaggeration that their long hours and years of working together bonds the actors like a family. Bell would love for the character of Nina [Tricia Cast] to return, as well. "It doesn't have to be a contract or arouse concern that it will blow the budget. Bring the fan favorites in for a couple of weeks because it's just fun to check in with characters we love." The long-running soap is in a good place, except for the recent tragedy with Kristoff St. John. "Oh, so sad," Bell said. "That was so hard, but it also bonds us together even more. We're a family and that was one of our own." Bell has good things to say about Josh Griffith and Tony Morina, who took over after the departure of Mal Young. "They completely understand that it's characters first, and it's human emotions first, and it's good story. Everyone's still there, Nikki and Victor are still there. Give the viewers what they want." Bell yearns for the return of the super couple, to feel the power that came from an incredible union like Lily and Dusty on As The World Turns, Craig and Sierra, and Luke and Laura from General Hospital. She believes in the power of soaps; "It still works." She wants more people to root for her and Paul to get together. "I would love more romance. I miss things like montages, I miss music. I miss theme songs that super couples used to have." For those concerned about where the show is now? Bell laid it on the table. "It's a happy place. Everyone's in a really good mindset." And finally, there is news about Bell's Daytime Emmy-winning web series, mI promise: it's now available on Amazon Prime! It's a story warning of the dangers of texting and driving. "I'd made that years ago with the intention of really making an impact on my teen. My daughter just got her license two months ago, and I keep trying to retrain these kids not to touch their phones when they bleep. I mean I put mine in the cup holder and they see when I drive and it bleeps I don't even look at it while I'm driving." "I wanted to make those episodes quick because kids want to see something in two minutes or less. And then I wanted to show that if she had the chance to do things over again, she obviously would have done everything differently. "People tell me they can't believe schools don't grab this because they could watch. In one week they can watch it quickly and have a discussion about it." And that's great, as long as the message gets out there." And that's Bells life now in a nutshell. She's over the moon about Nightmare Tenant, airing tonight on Lifetime Movie Network, excited about what could be coming for her soon on The Young and the Restless, and hoping her moving statement on the dangers of driving and texting will finally be seen by all of those who should watch. You can follow Bell on Twitter to keep up with all of this and more. Do us a favor, and click on the link above to get to view mI promise, watch The Young and the Restless weekdays on CBS, and tune into Nightmare Tenant on LMN tonight at 8/7c!